Take it from this undisciplined vegetarian who has, over the past eight years, had her meals scrutinized by skeptics and critics alike. Vegan food is no oxymoron, omnivores. For whatever reason, those two words can make the most ardent omnivore shudder. Or become defensive. Take it from this undisciplined vegetarian who has, over the past eight years, had her meals scrutinized by skeptics and critics alike. Vegan food is no oxymoron, omnivores. Some of my most memorable and satisfying meals have been entirely plant-based, and, as an added bonus, guilt-free. For the past two years, two St. Catharines women have been working hard to show people the merits of adopting a plant-based diet or at least making less room on their plates for meat, dairy and other animal products. Keri Cronin and Laurie Morrison founded Niagara VegFest in an effort to educate those hungry to try out more mindful eating, and their efforts have been devoured by the thousands that have attended VegFest in the two years it has run. But Cronin and Morrison, who became inspired to start the festival in 2012 after hearing about similar events in the U.S., need some help to ensure VegFest remains a free event that attracts the who's who of vegan and vegetarian cooking and eating. On Saturday, they're hosting Sip & Savour, a vegan cocktail party fundraiser, featuring local beer and wine, and everyone's favourite comfort food, cheese. 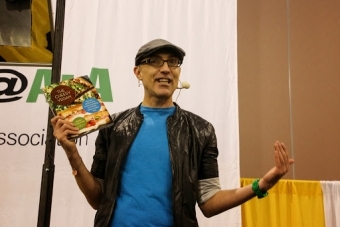 John Schlimm, author of the cookbook The Cheesy Vegan, which features 125 plant-based how-to's for indulging in cruelty-free cheesy creations, will be at the party at the Niagara Artists' Centre. He'll sign copies of his book and show that no one has to sacrifice the best things in life when adopting a vegan diet. The Cheesy Vegan is an approachable read with simple recipes to make your own vegan cheese with ingredients Schlimm promises are easy to source. Cheddar, brie, feta, Swiss, ricotta, parmesan, blue cheese — they're all covered and then some. They're followed by chapters covering starters, mains and desserts — even an entire section dedicated to macaroni and cheese — in which to use all those homemade cheeses that, until Schlimm's book, seemed off limits. Though Sip & Savour is a sold out affair, Cronin and Morrison answered some of my questions about being vegan in Niagara and offered a sneak peek into what's clearly the hottest ticket in town this weekend. How easy or difficult is it to follow a vegan diet in Niagara? Laurie Morrison: It is pretty easy as most of the grocery stores carry vegan prepared foods and, of course, there is Bamboo Natural Foods that is a really great store. These products (veggie dogs or veggie bacon) are especially helpful, or so I have found, when I was transitioning away from meat. These days, I eat a lot less of this and stick to whole foods. A diet of non-prepared foods is easy for vegans in most cities. Keri Cronin: Very easy! And it is getting easier all the time. In addition to having easy access to fresh produce for the majority of the year, places like Bamboo Natural Food Market and Rise Above (restaurant) are great go-to places for vegan options and ingredients. When I first became vegan, we would be sure to stock up on vegan grocery items (non-dairy cheeses, for example) when we were travelling because it wasn’t always easy to find them in St. Catharines or even in Canada. That isn’t the case any more. In the four years since I have been vegan I have really noticed a shift. Even mainstream grocery stores carry things like Daiya “cheese” and Gardein meat substitutes. More and more restaurants are adding vegan options and they aren’t shy about it. It is becoming more common all the time to see the “V-word” (vegan) on menus. What's the biggest challenge of being vegan and how do you overcome it? LM: Learning how and what to cook is a challenge though a really fun one (assuming you like to cook). There are a growing number of cookbooks and a lot of resources on the internet. Post Punk Kitchen by Isa Chandra Moskowitz is great as are all her cookbooks. KC: I think the biggest challenge is when I come face-to-face with people’s misconceptions — things like “Oh, it's too expensive to be vegan,” or “Why do you care about animals more than people?” or “It isn’t healthy to be vegan.” Often these misconceptions are directed at vegans in the form of rather blunt or challenging questions, but I try not to take it personally. I think that, often, these questions come from a place of genuine curiosity and I try to take the time to listen to see what really is behind the question or comment. What's the biggest misconception people have about a vegan diet? LM: I think people see it as a restrictive diet. To be fair, when I eat at most restaurants, it certainly appears that way as I ask the server to hold the sausage, substitute this for that, etc. A visit to a vegan restaurant will quickly dispel this idea, though. There is also the most common misconception and the question that every vegan gets: “Where do you get your protein?” Sometimes I’m a bit flippant with my answer and say “Plants! There's a belief that plants are not a good source of protein, which cannot be further from the truth. KC: That it is too expensive, difficult, or elitist. Sure, you can go out and spend a lot on prepared food and fancy kitchen gadgets, but you can do that no matter what kind of food you eat. This is not a requirement to be vegan. There are many books and websites out there that offer all kinds of suggestions, recipes, and tips on how to make simple, affordable, and nutritious vegan meals. How do cookbooks like John Schlimm's The Cheesy Vegan help in busting any myths about the vegan diet? KC: I think John Schlimm’s books bust a few myths: One, that vegan food is boring or uninteresting or that it doesn’t taste good. Just a quick browse through the table of contents of his book should dispel this. I also think his books help break down the stereotype of vegans as humourless people who take themselves too seriously. John’s books celebrate the fun side of eating and drinking – and heck, if we can have fun and not harm animals, why wouldn’t we? I think John’s books also bust the myth that veganism is a diet. It isn’t. It's a lifestyle. It is about so much more than what we eat and it is also not about losing weight. Sure, you can lose weight and be healthy when you take animal products off your plate, but this isn’t a forgone conclusion of veganism. VegFest has been a huge event the past two years it has run. What is it about the event that you think has resonated so much with people? KC: I think that people enjoy the festival for a number of reasons. First of all, it's a free community event in downtown St. Catharines. It is a family-friendly event, and we work hard to make sure that the atmosphere is fun and celebratory, a festival where you can enjoy yourself and sample delicious food. I think this brings out a lot of local people — people who are curious about the event but who are also looking for something fun to do on a Sunday afternoon in June in Niagara. Omnivores might be inclined to write off or dismiss VegFest, feeling like they wouldn't fit in or they may worry about being preached to and judged. What would you say to alleviate those concerns? LM: This is certainly something we were very aware of when we began creating the festival. The last thing we want is to create a negative experience for anyone. We make a conscious effort to create a fun vibe. One of the themes of the festival is compassion and we believe that this extends to everyone – to each other. The festival is about approaching the complexities of our food choices with gentleness. KC: We aim to create a non-judgmental environment where everyone is welcome. Even if someone has no plans to become vegetarian or vegan there is something for them at the festival. 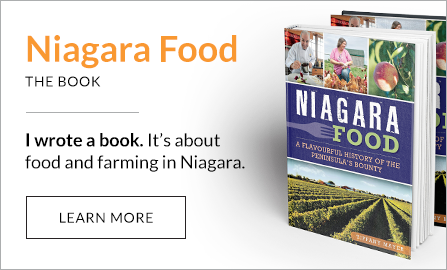 Perhaps they will pick up a recipe that shows them new ways to use their garden produce or perhaps they might find themselves going home with a cat they adopted from the Niagara Action for Animals catmobile. Or maybe they will just get a six pack of cupcakes to take home and enjoy. I mean, who doesn’t love cupcakes? They might catch a speaker who is talking about gardening techniques or they might enjoy watching a cooking demo. We have kids activities and all kinds of delicious food to sample. We will even have food trucks this year. There is, in short, something for everyone at the festival. What can people expect at the pop-up on Feb. 8? KC: The pop-up party is going to be a fabulous night. The night is hosted by John Schlimm, award-winning cookbook author and celebrity chef. The talented folks at Rise Above are going to be cooking up some dishes from John’s latest book for people to sample. There will also be local beer and wine, and desserts from Rise Above’s bakery. We have goodie bags for all attendees, and there are some fabulous prizes to be won as well. In short, it is going to be a fun night out in support of the festival. Good food, good drinks, good company. What better way to fight the winter blahs. Finally, what advice would you give to someone to help them incorporate more plant-based foods in their diets? LM: Substituting often seems to one of the ways to first start increasing plant-based foods. Try using veggie ground round in a meat sauce or cashews for a cream sauce. Small steps do not have to be hard or complicated. KC: Talk to people. 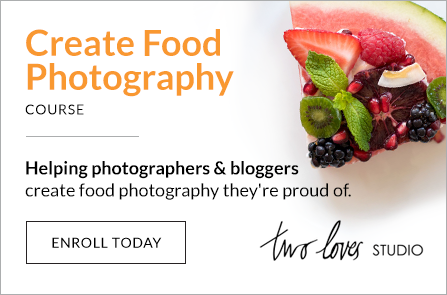 Join a cooking class, an online community, write a blog about the recipes you try, or share a subscription to publications like VegNews with your friends. Sharing recipes, ideas, tips and tricks is really important. I think this is why we are so committed to Niagara VegFest because we know first-hand how hard it can be if you feel that you are the only one in your family, school, or workplace that is interested in being vegetarian or vegan. Niagara VegFest helps people understand that they aren’t the only one wondering how to grow kale or how to cook tofu, and it also empowers them by giving them the information they need to make informed decisions — decisions that fit with their health goals or their personal ethics.